People pray at a mosque in al-Bab restored by a Turkish religious authority. Recovering from the brutal rule of the terrorist groups Daesh and the PKK's Syrian affiliate, the People's Protection Units (YPG), towns in Syria's north are looking to rebuild and for social revival. Turkey's state-run Presidency of Religious Affairs (DİB) has been helping Syrians in the liberated towns with the help of the Turkish Armed Forces (TSK) to restore mosques and revive religious education. Turkey has also extended a helping hand in the fight against the extremism that Daesh spread by distorting Islam in the region. 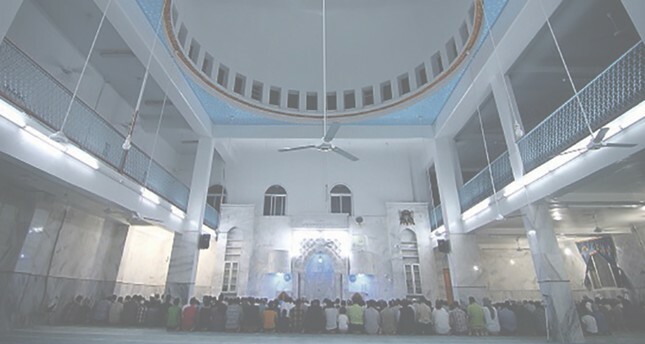 The Diyanet Foundation, a nonprofit linked to the DİB, spent more than TL 10 million ($1.61 million) to restore mosques, religious schools and similar facilities that were damaged by the terrorist groups. The DİB also prepared 30 videos in Arabic to promote the fight against extremism.Turkey launched Operation Euphrates Shielded with the Free Syrian Army (FSA) in 2016 to drive Daesh terrorists away from its borders. As a result of the operation, nearly 3,000 Daesh terrorists were eliminated, and a 2,000-kilometer-square area in northern Syria was liberated, including Jarablus, Dabiq and al-Bab. Also, militants of the YPG, which is linked to the PKK active in Turkey, were ejected from Syria's Afrin with Operation Olive Branch, Turkey's second cross-border operation in Syria, which was launched earlier this year. A report by the DİB outlines how the Turkish authority coordinated efforts in liberated Syrian towns in 2017 and this year and details the humanitarian aid sent to the region. In Jarablus, Azaz, al-Bab, al-Rai, Mare, Turkmenbareh, Ihtimalat and Akhtarin, 108 mosques were repaired. The religious authority is also working toward the renovation of 160 mosques in these towns and villages. Apart from mosques, buildings serving as offices of local religious authorities were funded. The DİB is also working on construction of several mosques. In a bid to boost the capacity of religious services, coordinators were assigned to Azaz, Jarablus, al-Bab, Mare and al-Rai and committees were set up to pick imams, muezzins and Quran teachers. A total of 1,019 imams, muezzins and teachers were assigned to mosques and religious schools, while 1,472 people were employed for religious services and maintenance work in mosques and schools. The Diyanet Foundation pays the monthly salaries of the imams, muezzins and teachers. Also, 607 Syrians underwent training in Turkey for religious services. Along with aid and assistance, Turkey seeks to fight extremism inflicted by warped versions of Islam propagated by Daesh. Some 200,000 Arabic books, booklets and leaflets touching upon religious matters were distributed in the region. They delve into a wide array of topics, from the practice of the Islamic faith to values in Islam and the exploitation of religion by Daesh. Similarly, 30 videos in Arabic released online aim to inform people about the real teachings of Islam and the dangers of extremism. In Afrin, a town with a large Syrian Kurdish population, the DİB assigned muftis to help coordinate religious work and funded three mosques opened in March. The religious authority also distributed Qurans in Kurdish in Afrin and education material to religious schools. On the humanitarian aid side, the Diyanet Foundation distributed food, water and hygiene materials to 3,200 families in Afrin and surrounding villages and hosted iftar (fast-breaking) dinners for hundreds in the Muslim fasting month of Ramadan this year. After the Turkish Armed Forces (TSK) liberated Syrian towns with the help of the FSA, Turkey has been involved in everything from building and restoring schools and infrastructure to training local police.